Nissan claims it is making one Quashqai every 62 seconds at its Sunderland, UK production site. Achieving the feat in a record-breaking 21 months, Nissan's flagship vehicle has become the fastest ever UK-built vehicle to reach the half million production mark. Since its start of production in January 2014, a new Qashqai has been built every 62 seconds on the Sunderland factory's Line 1, with nearly 100,000 - 20 per cent - of these being delivered within the UK. Nissan's Sunderland plant makes more than one third of the cars produced in the UK and was the first car plant in the country to make more than half a million cars in a year. This week's Qashqai milestone beats previous records set by Ford’s MK1 Cortina, which took 34 months to hit the half million landmark, and the Austin/Morris 1100/1300 which reached the same total in 29 months. Although originally designed for the European market the Qashqai is now in demand in 84 countries worldwide including Uganda, Zambia, and Saint Kitts. "The Nissan Qashqai is going from strength to strength," according to Paul Willcox, chairman, Nissan Europe. "Half a million Qashqais in just 21 months is an astonishing achievement and proof that the Qashqai is hitting the spot with buyers. "Together with the pioneering first generation version, there are now more than 2.5 million Qashqais on the road in Europe, making Nissan the undisputed leader in the Crossover sector." Total global production of the Qashqai now tops 2.5 million. From late autumn 2015 the new Qashqai will also be manufactured in St. Petersburg for domestic sales in Russia. 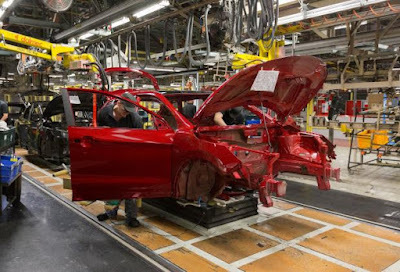 More than eight million vehicles have been built at Sunderland since 1986 when the Japanese company not only made its commitment to the UK as an important vehicle-producing country, but in setting up the plant its recruited top British managers from companies such as Ford Motor Company. There is an irony in Nissan’s choice of location. Just as Nissan has backed Britain for vehicle manufacture Ford has given up on Britain as a location to make cars, vans and trucks. Ford had vehicle plants at Dagenham, Halewood, Langley and Southampton. Only Dagenham and Bridgend survive in the UK within the Blue Oval, and they makes diesel and gasoline engines. Ford does, however, use Dunton as its engineering and research centre, tapping the intellectual resources of UK automotive engineers..
What attributes does Nissan possess that somehow Ford seems to lack? Ford also sold off Jaguar and Land Rover which it previously owned in the UK only now to see Tata Motors seemingly making a success of the enterprises. To pour more oil on troubled waters, two further Japanese companies have found fertile ground in the UK – Honda and Toyota. Some eighty per cent of the output from Sunderland has been exported to 100 countries. Last year, one in three cars built in Britain was a Nissan. In a recent investment at Sunderland, the forward-looking Nissan has invested £100 million in the plant to make the Juke which will secure jobs to 2020.